Carlos Guevara is a consistent lead role of our pages due to his prolific work, already broadly presented in past editions of Deco News (#9, #10, #12). Talented holder of ideas that renew and transfigure the Architecture and Design scene made in Venezuela, offering always proposals less orthodox that do not fear to express themselves. In this occasion, he presents a fragment of a more ample execution. 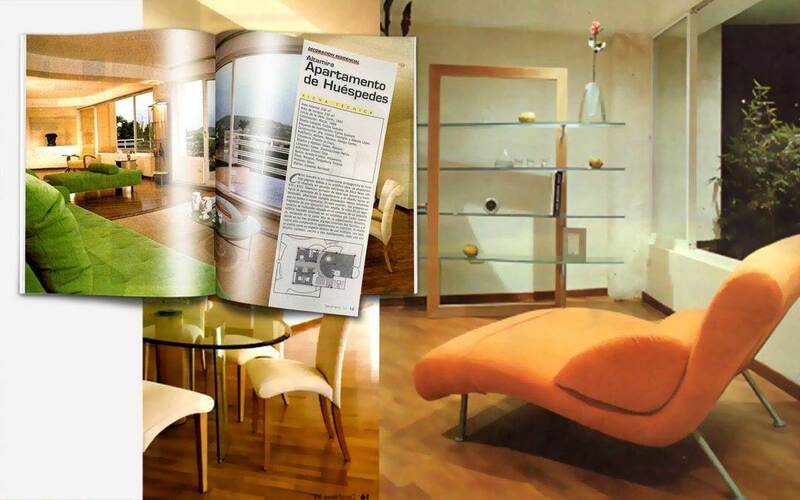 It has to do with a guest apartment located in the context of a small building also completely designed by Carlos Guevara, placed on the highest part of the Altamira neighborhood, where in the three first floors two families live and in the fourth floor is the aforementioned apartment. The same is thought of as a multiple use open space, with living room, dining room, kitchen and three bedrooms, each one with its own bathroom. Thanks to its excellent location it enjoys from an enviable view that surrounds all four sides, which is completely taken advantage of. For this reason, Carlos Guevara decided to conceptualize as a rectangular fish tank of 230 square meters of area by 2.60 meters of height and as a round off bordered all its perimeter with a great terrace of equal proportion (230 square meters). We do not have to mention that the open feeling is unique, thanks to the use of large windows that permeate the visuals of the city and its geography. The terrace area counts with a landscape development in charge of waved garden areas, that mark pause throughout a long tour of ethruscan ceramic and facades covered of grey slate. The access is originated in a hall located in the lower floor, where you enter an elevator that opens in this great space destined to the social areas, where the sole dividing element and visual imposed – outside the landscape – is a double curve wall located at one side, which collects and drives the guest to the bedrooms and service area. Likewise, this wall serves as background curtain to the dining room, with great niches, in its extremes to place art objects and ornaments. The decoration and design of the social areas was completely made by Carlos Guevara, who harmoniously combined diverse pieces of furniture and utility objects supplied by Novalar, Abitare, Galea, Design Center and Interni Casa, in a scenario of smooth friezes that debate between two tones, over a capure wood floor with carob edges.